In an astonishing result in Tuesday’s election, the message given to Mayor Rahm Emanuel was transparent, Chicagoans cannot be bought. The setback for Emanuel’s campaign was quite harsh considering he surpassed his fellow candidates by raising $15 million and outspent them in $7 million in campaign advertising. “Tomorrow morning I will be seeing you at the L stops,” said Emanuel to a crowd of cheers. “We will get back out there talking to our friends and families and neighbors as they make a critical choice about who has the strength, who has the leadership, who has the ideas to more this great city forward.” Emanuel won the mayoral seat when he first ran in 2011. However surprised Emanuel voters may have been, Garcia, 58, knew a run-off would be possible. 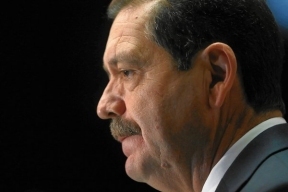 Within three weeks of officially announcing his candidacy, Garcia garnered 63,000 petitions and earned the support of Chicago Teacher’s Union President Karen Lewis. Garcia, a former state senator and alderman, thanked his supporters on Tuesday night at Alhambra Palace and promised he would work just as hard in the next weeks to convince voters he is better suited to take on the mayoral position. “They wrote us off. They said we didn’t have a chance. They said we didn’t have any money, while they spent millions attacking us. Well, we’re still standing. We’re still running. And we’re going to win,” said Garcia to a crowd of enthusiastic supporters. In addition to serving as a Cook County Commission, Garcia previously was elected to Chicago city council and served in the Illinois General Assembly. 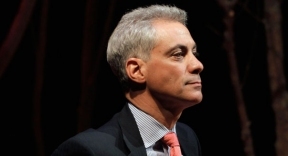 Mayor Emanuel will take on Commissioner Garcia in the first mayoral run-off election in Chicago history.